Cell Rep. 2014; pii: S2211-1247(14)00532-4. Deplus R, Blanchon L, Rajavelu A, Boukaba A, Defrance M, Luciani J, Rothé F, Dedeurwaerder S, Denis H, Brinkman AB, Simmer F, Müller F, Bertin B, Berdasco M, Putmans P, Calonne E, Litchfield DW, de Launoit Y, Jurkowski TP, Stunnenberg HG, Bock C, Sotiriou C, Fraga MF, Esteller M, Jeltsch A, Fuks F.
DNA methylation is a central epigenetic modification that is established by de novo DNA methyltransferases. The mechanisms underlying the generation of genomic methylation patterns are still poorly understood. Using mass spectrometry and a phosphospecific Dnmt3a antibody, we demonstrate that CK2 phosphorylates endogenous Dnmt3a at two key residues located near its PWWP domain, thereby downregulating the ability of Dnmt3a to methylate DNA. Genome-wide DNA methylation analysis shows that CK2 primarily modulates CpG methylation of several repeats, most notably of Alu SINEs. This modulation can be directly attributed to CK2-mediated phosphorylation of Dnmt3a. 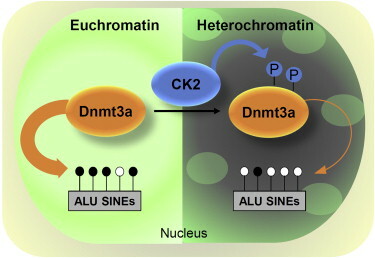 We also find that CK2-mediated phosphorylation is required for localization of Dnmt3a to heterochromatin. By revealing phosphorylation as a mode of regulation of de novo DNA methyltransferase function and by uncovering a mechanism for the regulation of methylation at repetitive elements, our results shed light on the origin of DNA methylation patterns.